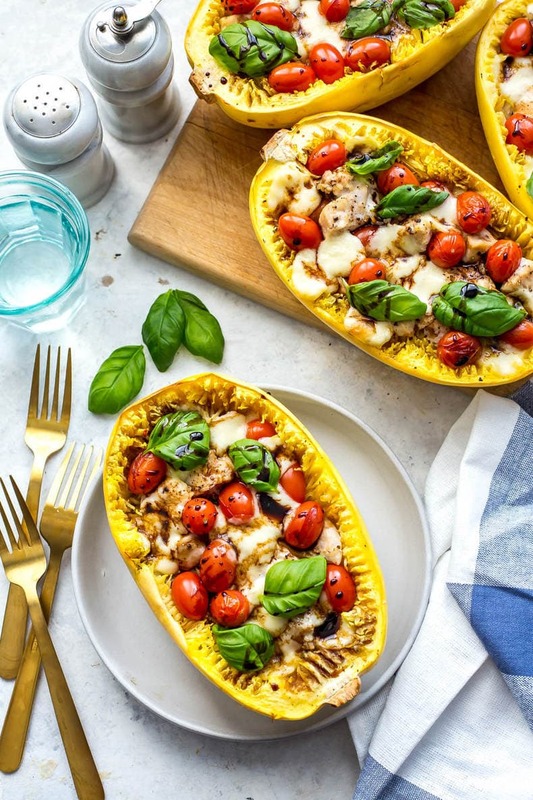 These Chicken Caprese Spaghetti Squash Boats are a delicious low-carb dinner option that is just bursting with flavour! Finished with fresh cherry tomatoes, basil, bocconcini cheese and a balsamic glaze, they're simple and delicious! This Chicken Caprese Spaghetti Squash is basically the epitome of summer, and I'm in love with all the flavours. It also comes in a handy squash “bowl” so you can save a bit of time on clean up and basically make them all on one sheet pan. 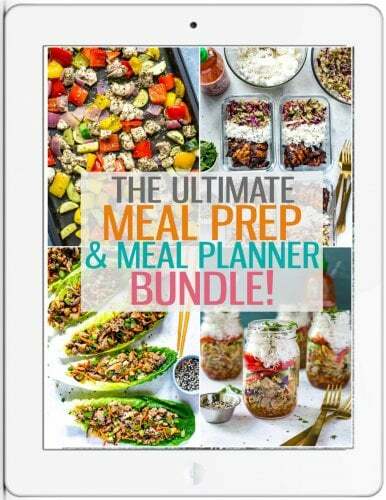 Honestly, dinner never looked so delicious or easy! When the warmer months hit, all I want is caprese everything, and a cold glass of wine. It's the time of year where everything just feels easier, and you're happy to be alive just enjoying life. And I know I'm getting ahead of myself a little when I say summer, because I know we haven't quite made it there yet. But I'm going to eat as though we are…and as far as I'm concerned, any temperature over 5 degrees in Canada is practically summer. 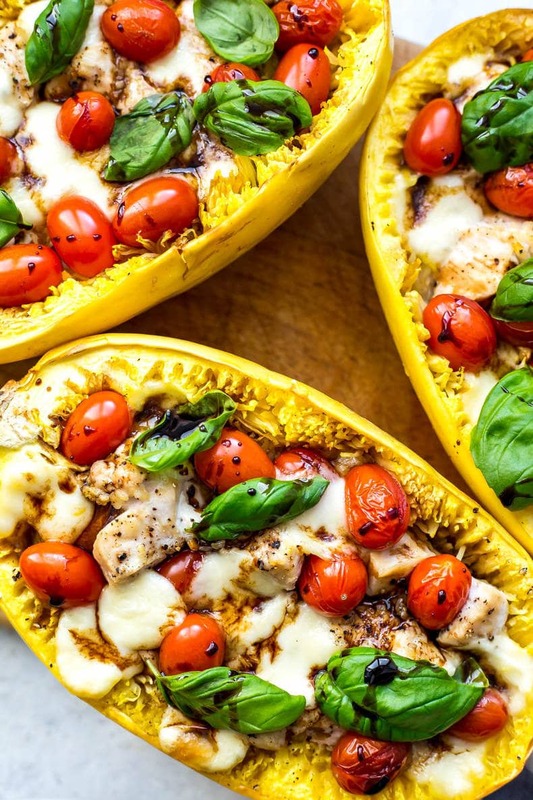 So, what do you need to know about this Chicken Caprese Spaghetti Squash? Basically, that it's one of my new favourite recipes. And yes, I kinda say that about all my recipes, but I really mean it with this one. 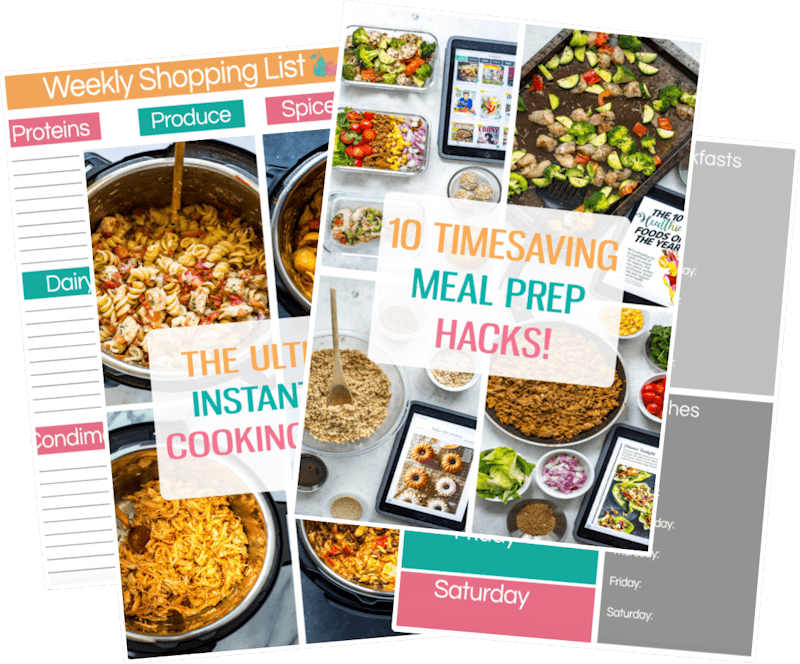 If you've ever followed along on my Instagram stories then you'll know that I often shoot my recipes in bulk, and sometimes that means going out and getting groceries for as many as 12 shoots or more in a week. I know, that's like 4 servings of a recipe times three, PER DAY. I'm bad at math, but that's a ton of food. And of course, because I'm making a ton of food, I often end up sharing it with my friends and family just because I can't eat it all before it goes bad. 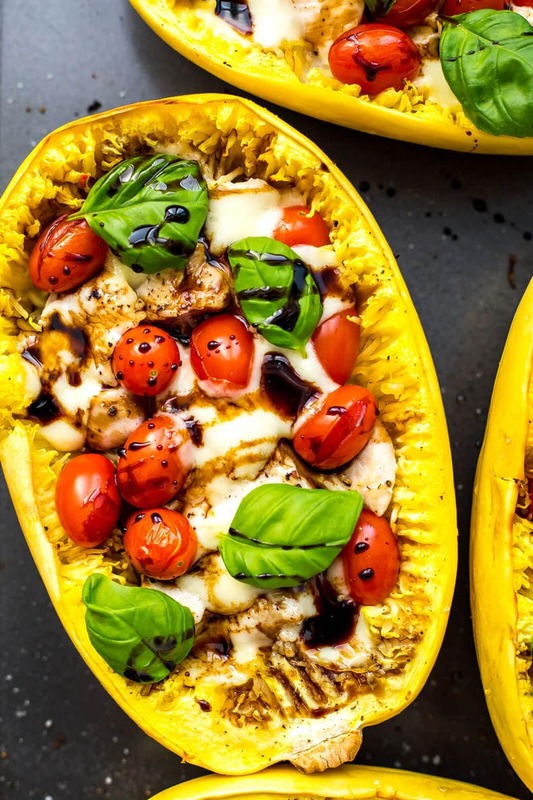 So often we're left kind of fighting over the best things I've made each week, and these spaghetti squash boats were one of them. They basically flew out of the fridge. And just LOOK AT THEM. They are pretty much taste as they look. Basically, you're going to want to bake your spaghetti squash until semi-tender in the oven, and then you'll scrape it with a fork to get those perfect strands of “spaghetti” looking squash. 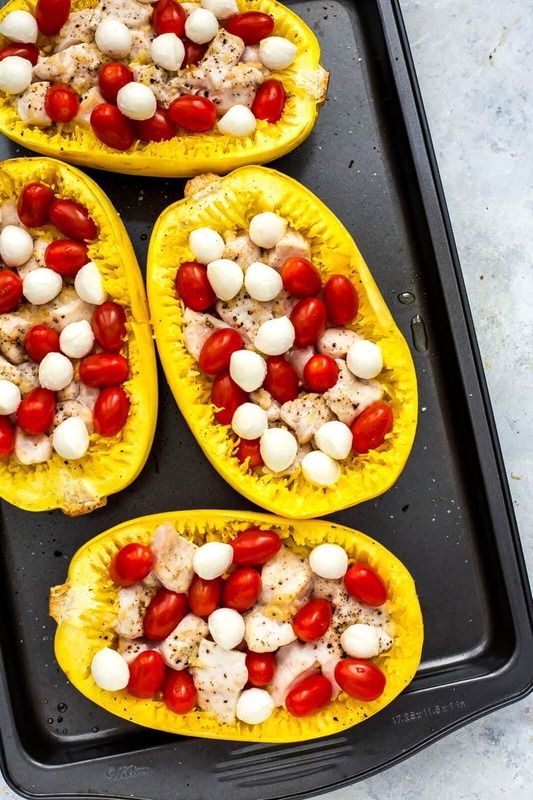 You don't want to cook the squash all the way because you also cook the 1-inch pieces of chicken on top for another 15 minutes and then add in your cherry tomatoes and bocconcini cheese, and cook that another 15 minutes. The back and forth taking things out of the oven is probably the worst part of this Chicken Caprese Spaghetti Squash, especially since I've been spoiling you with a bunch of dump and cook Instant Pot recipes that basically cook while you're chilling on the couch. 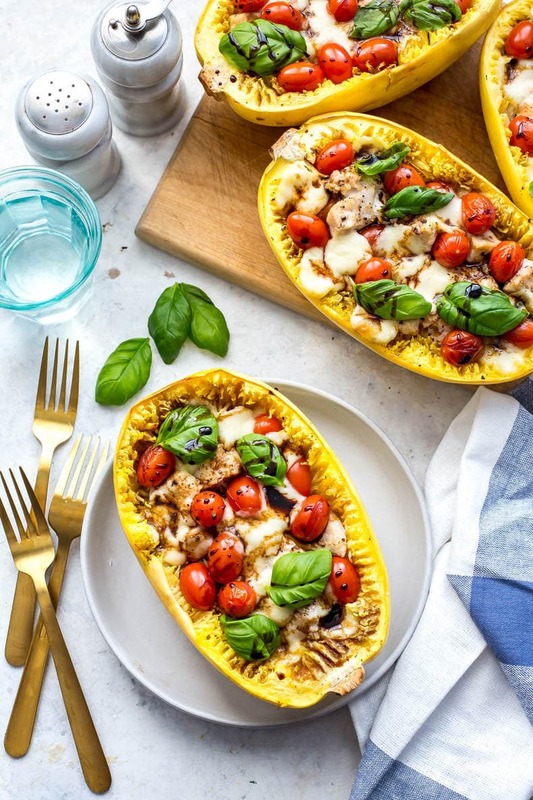 But I promise you these Chicken Spaghetti Squash Boats are worth the effort, and it's not as complicated as it seems. Once everything has cooked, you top with fresh basil leaves and balsamic glaze. 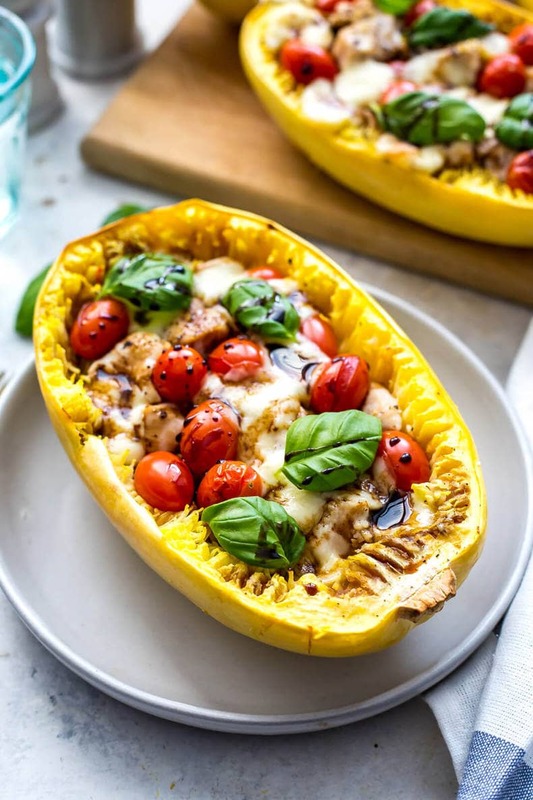 Spaghetti Squash calories are so low that you can add so many fun, delicious ingredients to make it feel more indulgent in a way you could never do with pasta. 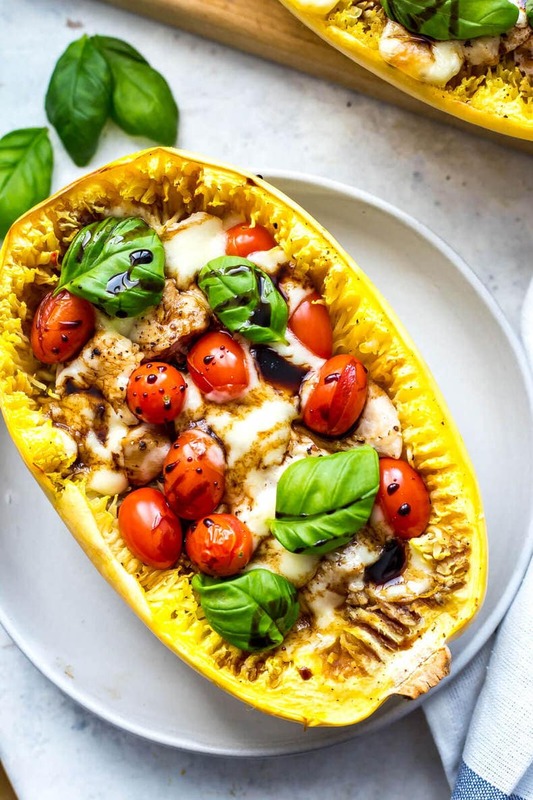 This caprese version of baked spaghetti squash is probably my most favourite yet! In all, you're looking at about 45 minutes in the oven but everything comes together on one sheet pan so there is very little mess. 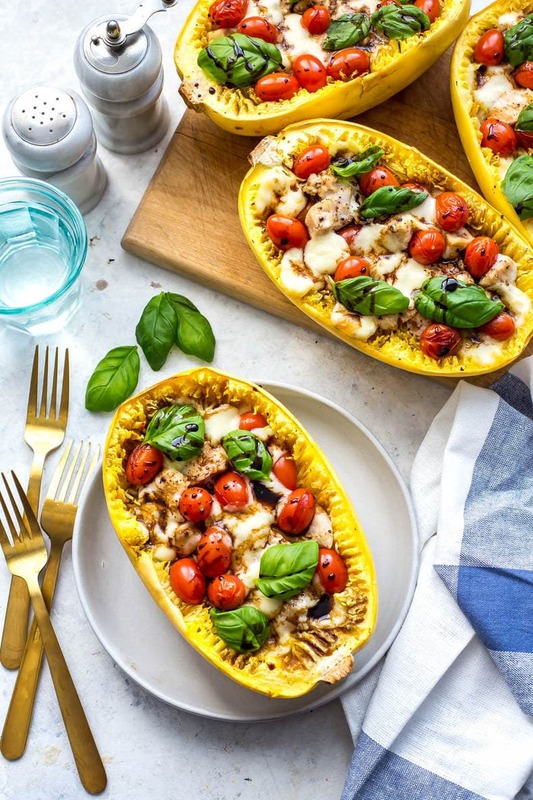 Technically, we could label this baked spaghetti squash a one pan dinner. I'm definitely willing to forgo all the dishes for a little more back and forth taking things in and out of the oven but that's just me. I think it's safe to say that I just LOVE caprese anything…from Caprese Steak Sandwiches to Caprese Portobello Mushrooms, I just can't get enough. It's such a simple combination and always results in some absolute deliciousness! 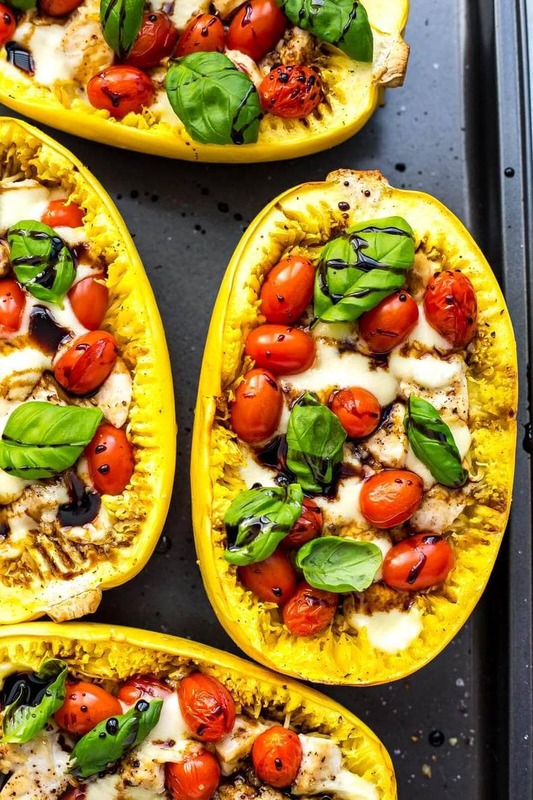 Will you be making these Chicken Caprese Spaghetti Squash Boats? I can't even deal with how much I love all the flavours here. Caprese anything just has my heart forever. What else should I try next, stuffed caprese chicken?! Preheat oven to 425 F. Microwave each spaghetti squash for 2-4 minutes in the microwave to soften them (the amount of time will depend on how large they are and how difficult they are to cut into). Cut spaghetti squash in half then scrape out seeds. Drizzle with olive oil, season with salt and pepper then bake in the oven for 15 minutes. Remove from oven and scrape out flesh using a fork. It won't be cooked through and it doesn't have to be perfect, even if you just get a little bit up the rest will come up during cook time. Top each spaghetti squash with raw chicken, then place back in the oven another 10 minutes. Meanwhile, make balsamic glaze (if not using storebought) by bringing balsamic vinegar and brown sugar to a boil over medium heat. Simmer for 10 minutes on med-low heat until it reduces and thickens. Remove spaghetti squash from oven again, and add cherry tomatoes and bocconcini cheese. Bake another 10-12 minutes until cherry tomatoes start to burst and cheese is melted. Remove from oven, generously top with fresh basil leaves, then drizzle with balsamic glaze. Serve and enjoy! Thanks. These do look appetizing. I’m on the keto diet, and I think I could easily adapt this to it. Hi Carol – the cheese is usually in a 200g package, and the cherry tomatoes I buy by the pint. Hope that helps! 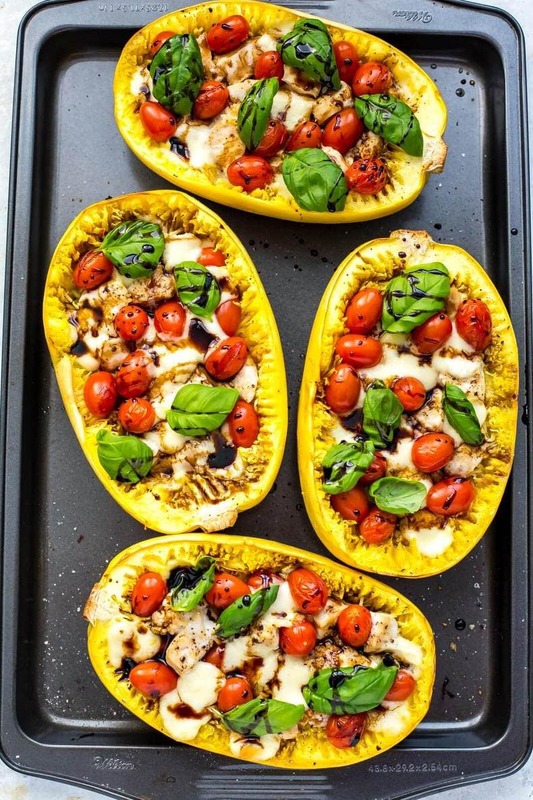 I’m super excited to make these, but I was wondering if you could recommend an alternative to the balsamic glaze on top? The smell of balsamic vinegar puts me off so I don’t eat it at all, but I also don’t want these to be too dry if you still think it should have something drizzled on top. I’m thinking the juice from the tomatoes will make that not a problem, but just thought I’d ask! Thanks. You definitely don’t need to add the balsamic glaze don’t worry 🙂 Everything should still tasty good/be juicy enough without it!